Sowbugs and pillbugs live their lives in moist environments. Common places for them to live would be under mulch, compost, stones, flowerpots and other places on damp ground. Some places the creatures may explore would be damp basements and first floor levels and garages. Points of entry may be door thresholds and cracks. They do not bite people or damage structures. However they can damage plants in a greenhouse in high numbers. 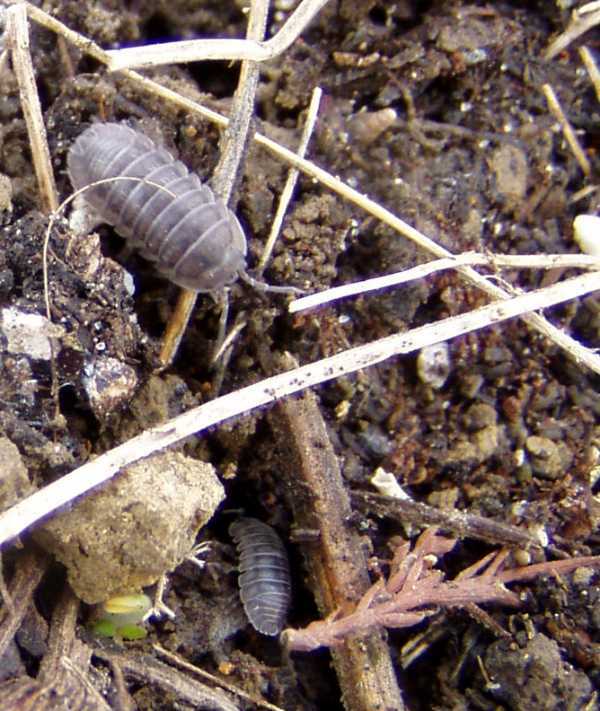 Sowbugs and pillbugs are scavengers and their main source of food is decaying organic matter. They do not survive indoors for more than a day or two without moist conditions. They are actually crustaceans that have adapted to living their life on land. They are closely related to lobsters, shrimp and crayfish and have gills. Eggs are laid by females and are carried in a pouch beneath the body. Young sowbugs and pillbugs, much like the adults, hatch from the eggs. The young remain in the pouch up to 2 months after hatching. In about a year they grow to maturity and breed mainly in the spring. They may live up to 3 years and have up to 3 broods. 1. Limit entry indoors. The best control to limit indoor entry is to reduce moisture near the foundation. Mulch, leaves and other plant debris needs to be cleared because this material attracts sowbugs and pillbugs. Don’t allow moisture to accumulate neat the foundation. Make sure that you have diverted water away with working gutters, downspouts and splash blocks. Drainage problems can be helped with drain tile and soil should be graded so that rainfall can drain away from the foundation. 2. Seal entry locations. Cracks or openings should be caulked or sealed in some way. Expansion joints and gaps outside and along the basement floor should be sealed to reduce entry of sowbugs and pillbugs. 3. Limiting moisture can prevent invasion. Vacuum cleaning and sweeping can clean up the pests. Insecticides can be used when all else fails. Applying insecticides such as Sevin, and Permethrin (Spectracide Bug Stop) can be accomplished with a compressed air or hose end sprayer. 4. Repot plants in infested soil. If found in pots indoors or out, simply tip the plant out of pot, scrape off the soil and replant in fresh soil. 5. If found outdoors. Sowbugs and pillbugs general do little or no harm to plants. In large numbers they may feed on plants at ground level or on small roots, but the only real threat they present is that the feeding locations can provide openings for bacteria or fungi which could result in rot setting in.